Up until now the only pierogies I ever had the pleasure of eating were found in the frozen food section of my grocery store and I thought they were good. To Read More, Click On The Recipe Title. There aren't to many people living in Kentucky that even know what a pierogie is, but in Pennsylvania we love them! They are Polish in origin and considered the national dish. There are churches in the coal region in Pennsylvania that get together once a week to make and sell them. About.com says Pittsburgh consumes 11 times more pierogies than any city in the nation. They love them so much that the Pittsburgh Pirates hold a pierogi race at the bottom of the 5th inning during every home game. 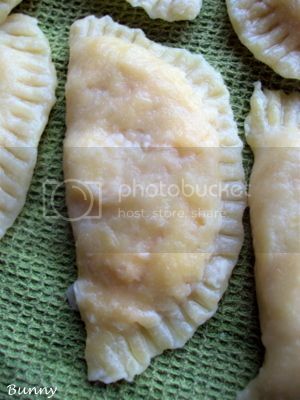 A pierogi is a crescent shaped dough that is filled with a mashed potato and cheese mixture but not limited to that filling. You can fill them with whatever you want to but the mashed potato and cheese mixture is definitely what most people think of.....or maybe it's just the one I think of! I found this recipe on my first search for pierogies on About.com. When I looked at the dough ingredients and saw sour cream and butter I ended my search. I knew this was going to be good. One and done. This recipe is absolutely delicious and EASY!! Enjoy! 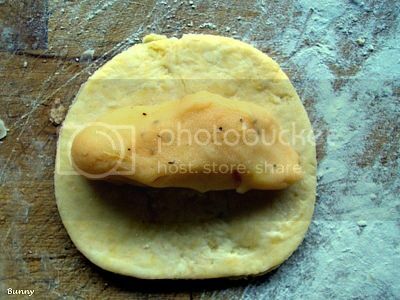 The pierogie dough was a dream to work with, it was soft and easy to stretch over the filling. The dough took a whole five minutes to put together. Using my hand I squished the dough together until it formed a ball. It's a moist dough, if for some reason you find it a little dry add a little more sour cream by tablespoons. Only work the dough until it forms a ball, then wrap it in plastic and refrigerate for 30 minutes if your using right away or up to 2 days for later use. For the first batch of pierogies I used my biscuit cutter to cut the rounds, the second time, I used the rim of a coffee cup that made about 1/2 an inch bigger round. I liked the bigger circle, bigger pierogi, more filling. The potato filling in this recipe is a fantastic base recipe. Some of the reviews for this recipe revealed that some people mistook 5 POTATOES for 5 POUNDS of potatoes and had gobs of filling leftover. It's only five potatoes, This gives you more than enough filling, as a matter of fact I made another batch of dough to use up the filling I had. I added more cheddar cheese than the recipe called for and added pepper to the mix as well. Make the filling, taste it, add what ever seasoning you like to it, it's all good. 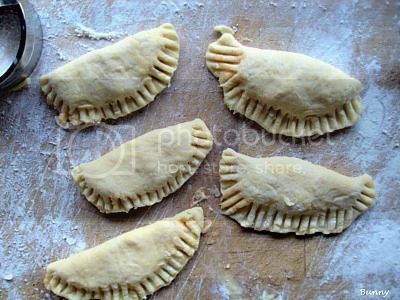 After the dough is rolled out and the filling is tucked away inside your Polish dumpling crimp the edges with a fork to seal it. Because the dough is moist I didn't have a problem with the edges sealing and staying together. After they were crimped I gently shaped the filling inside the dough to elongate it slightly, I wanted the filling to be evenly distributed in the dough. They may not look pretty but then I have no problem eating ugly food that tastes this good.. They are all ready for boiling. Get some water boiling and add a few( I did three at a time) to the boiling water, when they start floating to the top take them out to dry, again not very appealing at this point but it gets a whole lot better trust me. After they dry, which doesn't take long at all you have two choices, use them or freeze them. I did both, I have no patience and couldn't wait to taste them. To defrost my frozen pierogies I microwaved them for 90 seconds at 30 second intervals. They were perfectly defrosted and ready to use. 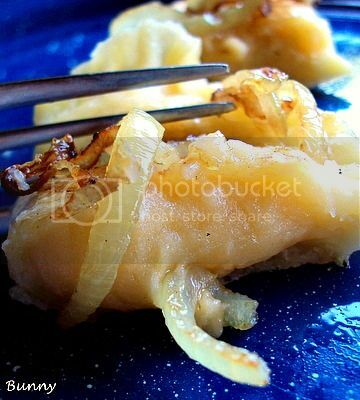 To cook a pierogi you first saute onions in butter, get them nice and caramelized. Remove the onions and place the pierogi in the same pan you carmelized the onions in and add a little more butter. Fry the pierogi until a nice brown crust forms on both sides, plate it, put the onions on top and dig in. Pierogi Heaven !!! YUMMY!!! 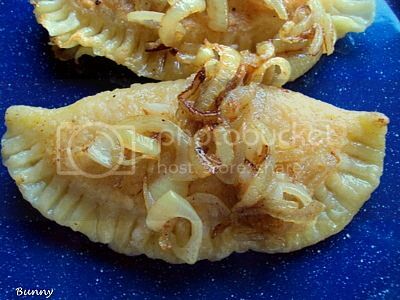 I love pierogies, espically smothered in onions! I will be making this for sure! Can't wait to try this recipe. I grew up in the Pittsburgh, PA area enjoying Pierogies homemade by my paternal Grandmother. I've never tried them myself; but you may it look so easy. Keep those recipes coming.Thanks Bunny! I had a Polish friend who gave me a recipe for Pierogies years ago. And I haven't made them since. Your recipe sounds great and I'd love to try it. i've never eaten pierogies, but they're quite tempting. i love the cooked onions on top! oh, love the sound of these.... my sister used to make them by the dozens..to hundreds with her mother in law...but, that was years ago...she doesn't bother anymore...but, I must give them a go now.... everything old is new again. Time for yummy pierogies!